Yes, I know that many are saying about different moves and mantras, giving out instructions on how to perform it "correctly". These are all indeed rituals. Rituals shouldn't be underestimated, their power is great, since ancient times priests of different "deities" and "gods" were performing rituals to heal or to foretell the future and as well change the outcome of future through choices/wishes or wishful thinking. Rituals are a moves that are fusing physicality with spirituality, that is physical world with ethereal spiritual world. Such fusion is making a big change within physical reality and as well in spiritual. You know of ancient "relics" and "holy water", these physical items are charged with energy through power of sounds/words and great Energy of wishful thinking. "Holy Water" indeed has a great effect on a body, when it is charged. The more charge there, the more the effect is being felt. Rituals though can be used in both ways, in Good and evil. Illuminati and Freemasons are performing dark rituals with sacrifices to meet their dark evil ends, such rituals are resulting in curses and prevention of this World changing in Harmonious Way. With these rituals they are concealing reality and creating an illusion, as well bringing themselves success in finances, geopolitics and so on. You pointed out correctly, be guided by Your Higher Inner Self, if You don not feel that "instructions" on rituals are not resonating with You, You are always free to make ritual in Your own way, how You feel would be right or not make ritual at all. Click here for link discussed below. Thank You very much Good Friend Michael for providing link to dichotomy of the present time. Not all photos are pleasant, yet there was one photo which is in relation to this question of rituals, "100,000 monks in prayer for a better world", Meditation and Prayer are as well rituals. And how You do it, what intent do You have during performing such rituals is the most important, not the way how You do it. Yet there are many effects which can be achieved, through positioning of objects and different moves of Your body, as well making a different sounds with different frequencies and combinations (prayer and mantras). So as always Your own discernment is most important! Click here for video discussed below. Good Friend Remi, very great video You presented, there is a lot told there about hidden symbology and all of this is connected with the same demiurge and this whole experiment. Not everything there may be truth, but as always, Your own discernment is most important, believe in what You think is right. I liked the part at 12:02 mark. This is a part where is told about vector and "7" symbol is as well represents an oval and "eye of satan" - antigod/anticreation, there was a video I presented previously which was made by former freemason, he exposed to You and Everyone the significance of oval in freemasonry. You never thought why White House is having exactly "oval office" and not round or squared? These symbols are present not only on space agencies' logos, but as well on many many trademarks and brands, which we are buying and using everyday, be as well notified, that when You are buying product with oval, there may be chemicals that are damaging to Your body, all chemicals that goes after in "E" classification are dangerous and most importantly all that goes after E621 are untested on human organism and can modify the DNA, they are used only in industry, but some products like potato chips, or many sweet products, like chocolate are having them, it is always wise to check the ingredients before buying what Yo are going to eat. Basically when You are buying a product with hidden symbology like eye, pentagram or oval, You are "agreeing that they are going to poison you and that you are supporting their system and their god". Remember, right now We are in the middle of Grand Cross, it is yet not fully formed, this Grand Cross may be a very big event for this Planet, this depends almost solely on Humanity, We GEs are working on preserving stability and preventing all conflicts. Aid this World how You can, meditation and wishful thinking is more that enough! Magnetic rotation technologies are spreading slowly, but surely. Remember You can aid this World and Humanity by spreading the knowledge of this technology, Thank You Good Friend Michael for sharing link to Good Friend Hope Girl, She shared the schematics for constructing her own design based on Tesla's records, which is working very well and gives a great energy charge! Good Day Sophia and Everyone! Happy Easter to You - the Celebration of Birth and Rebirth/Reincarnation! This is not a christian-only Celebration, it was celebrated since ancient times, this is a time when children are being "made". This is when Great Circle - Circle of Life begins! 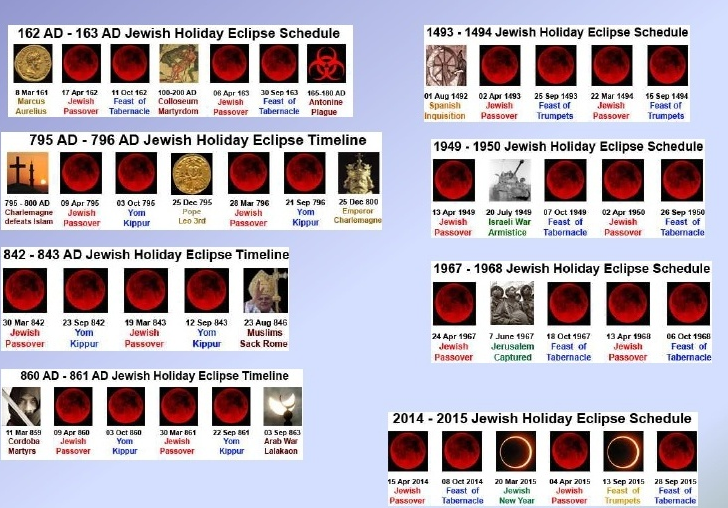 As You can see, much important for jewish nation events happened on lunar eclipse's tetrads when they aligned with feasts. Something to add to "coincidences". As You remember there are no coincidences, everything what is happening is happening because of something, as there is always a reason for it and there is always connection between things that are called "coincidences". Everything is interconnected. This is all a part of this grand Cosmic Intervention which We are experiencing at the moment. Big changes (physical) should start happening now on Grand Cross, or after partial Solar Eclipse. We should also meditate, so that changes wouldn't be "aggressive", which will create conflicts. Nothing to say about the news, except that all is the same for now. Situation is very tense, illuminati order are waiting for a possibility to start a big war, they are pushing hard on Ukraine as You can see, U.S. government and CIA are ordering Ukraine to suppress People of east Ukraine with army and radically aligned individuals. Something that is very disturbing. Illuminati's destiny is written and they are collapsing, yet what troubles us, is that they are stubborn in neverending greed/lust for power and other People's suffering.. In the coming Earth cycles, meditate/pray for Universal Harmony/Peace on Earth and Your united wish of ending experiment sooner-better! We are already having a form-up of Grand-Cross, and Lightworkers from Cobra's blog are going to meditate and make wishes on 21st april, so this is a great possibility to bring in great transformation, avoiding any and all conflicts! As we are approaching important date of april 15, which will be a 1st out of 4 lunar eclipse or "blood moon"
where You know, forever it was considered that Mars is the "planet of strife/conflicts/wars". As well Mars and Moon will be very close to each other on 14th april. Along with "blood moon" first of four, this creates a big possibility for a breakout of big conflicts. We have a big major pressure on 4 locations in the World, where such conflicts may break out. 1. Most important is Syria, illuminati order wishes to invade this country and recently they and Turkish government were planning to make a false flag attack on Turkey and blame Syria for this to justify the invasion, You also remember that Turkey is the member of U.S. NATO military alliance which makes it a dangerous twist. Turkey is arming the "rebels" which are mercenaries and extremists to "change regime" in Syria. Turkey is very closely associated themselves with cabal. 2. Then we have the pressure in North Korea, where North Korea wishes to make "The Killshot" prediction to come true, that is to launch nuclear missile to South Korea. 3. The pressure in Ukraine, where extreme russophobic nationalists wish to invade Russia and are asking for military aid from U.S., EU and NATO, right now they are quiet, yet this may turn differently when Mars and Moon will be united. 4. And last is still the same plot to make a false flag on eastern coast of U.S. Unfortunately, they still don't wish to give up and surrender, on the opposite, illuminati are making more aggression and provocation. Recently U.S. military was mobilized for a possible nuclear false flag on eastern coast which can be delivered whether "by plane" or "by ship" like they said. The missing flight plays it's role here, duplicate in Israel can be used for this plot, so it will be a time which We All need to look for! This big pressure for conflicts will end when Moon will reach opposite side of the Earth and make annular Solar eclipse on cycle - april 29th. This will mark the end of "times of uncertainty" as indeed these times are very unpredictable and everything can happen from april 14 until april 29, because strife and conflicts are closely associated with destruction thus with primal force of chaos and chaos as You All know is opposite to Order and is very unpredictable in it's nature. Anyway, the illuminati order is falling apart and these are the end times for illuminati/cabal and because they are making even more blatant resistance and challenge to Creation on the opposite of simply giving up, I will say that they are playing with fire and they can have a situation where all their bloodline will not be spared, they brought maximal Justice on themselves.. Now we heard that neither Light Followers, neither Forces of One will spare them on "normal conditions", yet if intervention would follow, they will be given one more chance to give up and cease confrontation and if they refuse, then, there wouldn't be any salvation for them.. This is all about current very tight situation, I advice Everyone to meditate and prevent all of conflicts from taking place, You know where You need to put Energy for Peace and Harmony. Let there be Peace and Mutual Understanding between Everyone!